History in the making will take place on October 29 at Vandenberg’s Space Launch Complex-2. This is when a United Launch Alliance Delta II carries the COMSO-4 satellite into space at 7:20 p.m. PDT. This will represent the 350th launch in Delta program history and it will occur during our year long 50th anniversary celebration of the program. The mission was procured by Boeing Launch Services and was launched for the Italian Space Agency, the Italian Ministry of Defence and Thales Alenia Space. The first Delta launch occurred on May 13, 1960. 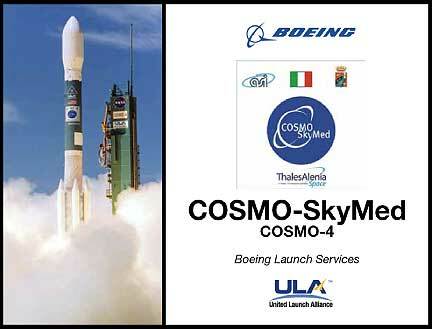 COSMO-SkyMed, the new system for Earth observation entirely developed and produced in Italy, is based on a constellation of four radar satellites. Each satellite is equipped with a high-resolution Synthetic Aperture Radar (SAR) operating in X-band and flexible and innovative transmission equipment for the high-speed downlink of the acquired data to the receiving ground stations. The system ground segment consists of infrastructure devoted to the management of the constellation (Mission Planning and Control Center and Satellite Control Center), services for the management and planning of user requests, and services for the gathering, processing, archiving and distribution of data to the users. Delta II’s launched the first three COSMO satellites on June 7, 2007; December 8, 2007 and October 24, 2008.